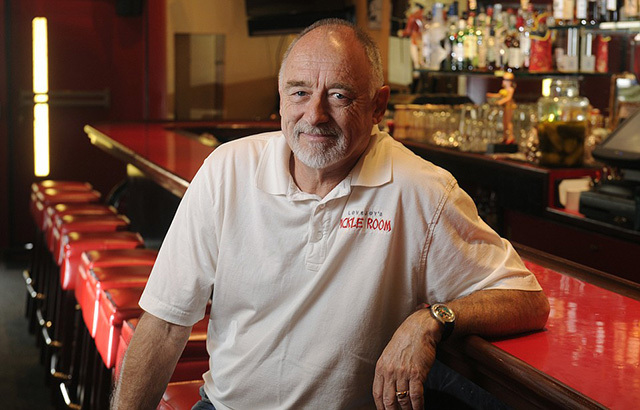 Bob Lovejoy, owner of the Three Pickles sandwich shops at 126 East Canon Perdido Street and 420 South Fairview Avenue in Goleta, and the force behind the reincarnation of Jimmy’s Oriental Gardens as the Pickle Room, died in early July from an aneurysm or a stroke. He was 71. Too soon. I admire him for retaining the look and vibe of Jimmy’s when he got the place. Tommy would have been happy. Condolences to his family. Who comes from a career as a contractor and successfully opens three restaurant establishments in Santa Barabara? Wow! Didnt know him well he always had a friendly smile and kind words. Loved and respected. RIP. Very much loved and respected, now missed! Super, SUPER nice guy. Condolences to the family. I am so sorry to learn about his death – too young. He was always so kind – even walked a block and a half with me back to my office to help me with a large takeout order. That has never happened in my experience. Very nice gentleman and will be sorely missed. Such a good guy. Will be missed. Met this man one night at Arnoldis having a drink and asked him a few questions about running a business. He was kind, thoughtful and generous with his time. For those who new him far better I am sorry for your loss.